New York is a state which most people do not immediately connect with the Amish. But today over 12,000 Amish live in New York, in 89 church districts. The Empire State first saw Amish settlers in 1831, and has had a significant Amish presence since the 1970s. In recent years New York’s Amish population has grown by leaps and bounds, with over a dozen new settlements having been founded since 2000. As described in David Luthy’s The Amish in America: Settlements that Failed, 1840-1960, the first Amish settlers to New York arrived in 1831. These pioneer Amish settled in Lewis County near the town of Croghan in upstate New York. This settlement grew during the 1830s and 1840s, attracting settlers from Alsace-Lorraine in Europe. Eventually the settlers in this original group assimilated with more progressive churches, and by the 1950s the descendants identified themselves as Mennonite. The next New York Amish community was not founded until 1949, in the Conewango Valley of Cattaraugus and Chautauqua Counties. The Conewango Valley settlement is currently the largest in New York, with 13 church districts as of 2008. The Conewango Valley is home to the oldest and largest Amish settlement in New York today. In New York Amish: Life in the Plain Communities of the Empire State, Karen Johnson-Weiner outlines the founding of this settlement. The first group to arrive, coming from Pennsylvania and Ohio, consisted of members of the highly conservative Troyer Amish group. Members of this group were motivated to come to the Empire State in order to acquire farmland and maintain an agricultural tradition. Additionally, Johnson-Weiner notes that the move to New York allowed the new settlers to avoid ongoing church dissension in the Holmes County Ohio settlement, which had earlier resulted in the formation of the Swartzentruber Amish affiliation. The Troyer group itself formed in Holmes County in 1932 over conflict concerning excommunication. Moving to New York allowed these Ohio Amish to preserve homogeneity and start anew, away from threats in other communities. Today the Conewango settlement is one of the most conservative in New York. Johnson-Weiner describes Troyer Amish homes as lacking “linoleum floors, carpeting, sofas, and other upholstered furniture. There are no indoor toilets, and homes are lit with oil lamps instead of gas or battery powered lamps.” (New York Amish, Johnson-Weiner, p35). Amish in this settlement have maintained a strong agricultural lifestyle, producing milk for a local cheese factory. Amish in the area are also involved in small industry, with businesses including basket-making, furniture production, harness, and sawmills. Amish here are conservative in outlook, but practically oriented to the public in many of the enterprises they run, selling products to local New Yorkers and tourist visitors alike. The area of Heuvelton, in St. Lawrence County in upstate New York, is also home to a highly conservative group of Amish. This Swartzentruber Amish community was founded in 1974. Johnson-Weiner explains that the motivation for the move, like that of many Amish migrants, was affordable farmland. Similarly to the Troyer Amish migrants to Conewango Valley, New York also offered these Amish settlers refuge from conflict and threats from more progressive Amish groups in their home settlement of Holmes and Wayne Counties in Ohio. Like other Amish, Swartzentruber life is dictated by the Ordnung, a set of guidelines for daily living. The Ordnungs of Swartzentruber Amish groups are particularly strict. 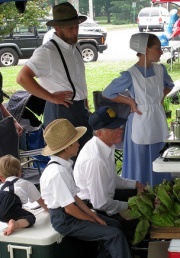 The hair of Swartzentruber men is longer than that of other Amish, and women’s clothing is heavier. Homes are typically sparsely decorated, and follow a standard design plan. Swartzentruber buggies lack a slow-moving vehicle triangle, electric lighting, windshields, and mirrors. When it comes to technology, battery-powered flashlights are permitted in Swartzentruber districts, but most other forms of power, including hydraulic and air power, are not. Swartzentruber shops are typically operated using a diesel engine which turns a crankshaft running underneath the floor. Belts emerge from the floor in various places along the shaft to power saws and other equipment. 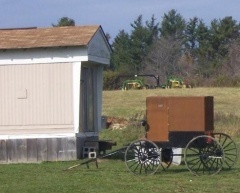 This method of generating power is common among the most conservative Amish groups, for example being seen amongt the tradition-minded Amish of Big Valley in Pennsylvania. Despite the restrictions of the Ordnung, the Swartzentruber Amish of New York participate in local economies. In addition to agriculture, the Amish of Heuvelton are active in cottage industry. Johnson-Weiner notes that “in New York’s North Country, the women quilt much more, and the majority of the quilts they make are for sale outside the community” (New York Amish, Johnson-Weiner, p 71). Adolescent girls are involved in quilting, and quilts are purchased by tourists and vacationers. Some quilts are also assembled by Swartzentruber locals for eventual sale by Lancaster County Amish. Johnson-Weiner notes that Amish women in the area produce a variety of goods for sale that they themselves would not use, including Christmas tree skirts and toaster covers. Other businesses in the area include those that cater to Amish, including harness makers and buggy shops, as well as bulk food stores. Men operate businesses commonly found in Amish communities with restrictive Ordnungs, such as sawmills. 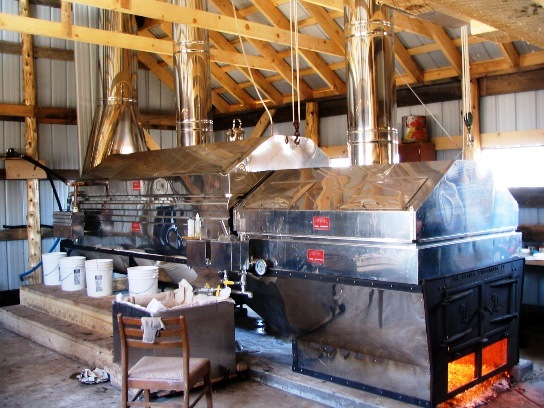 Recently, Swartzentruber churches decided to allow the use of bulk tank milk dumping stations, following the closing of a local cheese house which had previously supplied product for stores across New York, providing a market for Swartzentruber Amish dairy farmers. This allowance has permitted Swartzentruber Amish continued access to a market for their milk, as unrefrigerated Swartzentruber milk could previously only be sold for cheese making. This decision to change testifies to the fact that the rules and guidelines of an Amish community are not static, with change happening even among the most conservative groups. Johnson-Weiner observes that as the Heuvelton community continues to grow, an influx of outsiders, many from outside New York, has added pressure to the Heuvelton settlement. Land prices have risen and competition among local Amish has increased. Today, the Heuvelton Amish community is the second-largest in New York, with 11 church districts. The Amish of Clymer originate from Geauga County, Ohio. Like other Amish immigrants to the state, land pressures motivated Amish in Geauga County to seek land in New York in 1976. Clymer Amish are relatively progressive compared to other Amish in the state, including the nearby settlements at Mayville and the Conewango Valley. Amish businesses in Clymer create harnesses, sell housewares, and do carpentry work. They also operate a number of tourist-oriented businesses. Clymer Amish have fewer technological restrictions than many nearby New York settlements, evidenced in the style of buggies they drive, the allowance of telephones in phone shanties, as well as the types of businesses they run. Clymer Amish also follow a more moderate approach to social shunning. In the valley of the Mohawk River in central New York, a number of Amish groups have established settlements since the 1980s. Karen Johnson-Weiner outlines the diversity of settlement in this area, which includes Old Order, Swartzentruber, Byler, and Andy Weaver Amish. The Byler Amish settlement, at Fort Plain, was the first established (1986) and has grown to be the largest in the area, with 5 church districts. The newest, a Swartzentruber settlement at Poland in Herkimer County, was founded in a location previously occupied by an unrelated Amish settlement. The two Old Order group, both found in Otsego County, originate from Delaware and Geauga County, Ohio. Though they are both considered Old Order affiliations, they live by different church standards and so are considered different settlements. 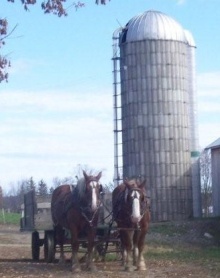 Andy Weaver Amish settled in Montgomery County near the towns of Glen and Fultonville. The Andy Weaver affiliation originates in Ohio. Settlers to this part of New York left their home community at Ashland, Ohio largely due to long-standing concerns over behavioral standards among youth in the settlement. Andy Weaver Amish are more conservative than mainstream Old Order affiliations, but less so than Swartzentruber Amish. Andy Weaver churches typically permit more limited technology than Old Order congregations, and adhere to strict shunning. Amish in the Mohawk Valley of New York exhibit the wide range of diversity found in Amish society. Ranging from more progressive Old Orders to conservative Swartzentruber Amish, a variety of cultural practices and technological allowances are seen among local Amish. The different approaches of the Amish groups in this part of New York have led to differing interactions with non-Amish residents. They have also led to different ways of making a living, ranging from traditional dairies to tourist-oriented enterprises. Perhaps unsurprisingly (due to its proximity), a number of New York Amish communities have been started by settlers from Pennsylvania. The settlement at Mayville (1976, 2 church districts) was started by Amish from New Wilmington, Pennsylvania. Like the Amish in the parent settlement at New Wilmington, these settlers to New York (known as Byler Amish) are easily distinguished by their brown-topped buggies. This group of Amish also follows a restrictive Ordnung in comparison to most Amish. Amish here follow a strict interpretation of shunning (Meidung). Though they do use the SMV triangle and lighting, buggies lack a front windshield. Clothing is plainer in this community, and wagons are equipped with steel-rimmed wheels. Homes of Byler Amish lack indoor plumbing and gas lamps. At the same time, Johnson-Weiner notes that visitors to this region of New York are guided to local Amish-run businesses by a helpful map, indicating that some Amish make ends meet operating businesses patronized by non-Amish clientele. Another New York Amish community founded by settlers from the Keystone State is found at Lowville (1 district), in Lewis County, home of the original Amish immigrants to New York. Settlers from Path Valley (Franklin County, PA) arrived in this region of upstate New York in 1999, and were joined by Amish settlers from the Lancaster County daughter settlement in St. Mary’s County, Maryland. As with many other Amish migrants to New York, relatively inexpensive farmland was a big draw for the Lowville newcomers. Settlers left behind high prices for acreage in both Pennsylvania and Maryland and set up dairies in this less-populated region of New York. Farming is common here, and local Amish are able to provide higher-grade milk thanks to bulk dumping stations, reminiscent of the arrangement found in the Swartzentruber Amish community at Heuvelton, (NY). Lowville Amish maintain a stricter Ordnung than that common in Lancaster County, with its entrepreneurial orientation. Johnson-Weiner reports that “The Lowville settlement has yet to permit telephones in shops or even to put up a phone booth for use by community members” (New York Amish, Johnson-Weiner, p89). This stands in stark contrast to the Pennsylvania and Maryland communities, where cell phones and phone shanties are common. New York is home to two dozen Amish settlements. The Amish of these varying communities, spread across the state, come from a variety of different backgrounds and follow widely differing Ordnungs. Diversity has implications for life within Amish society. The closeness of one community’s Ordnung to that of another may dictate whether two Amish groups interact. In addition to the Swartzentruber, Byler, Old Order, and Andy Weaver groups detailed here, New York is also home to Swiss Amish settlements, in the upper north part of the state (Norfolk, 1974, 1 district), as well as at Clyde (1997, 1 district) and Prattsburgh (1979, 1 district) to the West. Diverse approaches to Amish life impact everything from the way one makes a living, which other Amish groups one interacts with, as well as relations with the non-Amish public. Some Amish have been well-received by local New Yorkers. Karen Johnson-Weiner points out that Amish arrivals to Lowville in Lewis County were greeted with open arms. Locals saw in the Amish immigrants the arrival of positive values and economic revitalization. More progressive Amish in other areas of New York also may host benefit suppers open to the public, which fosters ties and promotes cooperation. In other areas, however, the relationship between Amish and non-Amish New Yorkers has not been so sunny. Conflicts have occurred over horse manure and building codes. Some of these conflicts have been elevated to legal battles in which Amish religious rights have been pitted against local regulations. A factor in such disagreements is the conflict between Amish ways and local expectations. Due to previous experience with Amish, or pre-existing perceptions, non-Amish New York residents may expect Amish to behave and operate in a specific way. In reality, the practices and orientation of Amish can differ widely among different affiliations. Some Amish groups in New York also adhere to more restrictive standards, which leaves less room for compromise over an issue such as building codes, and subsequently greater chance for conflict. As the Amish population continues to grow in New York, diverse practice among Amish will factor into relations with non-Amish communities. Tourism exists in New York Amish settlements, but to nowhere near the degree it does in better-known Amish communities such as Shipshewana in Indiana or Lancaster County, PA. Tourist industries in New York may focus on quilt making, producing products for sale to visitors such as baskets and furniture, and even offering services such as buggy rides and homestyle meals (read more on Amish furniture in New York). Though there is no hard and fast rule, the level of tourist development often depends on how conservative a community is, how large and well-established it is, and its proximity to population centers. On the whole, Amish have found success in settling in New York. While different Amish settlements grow at a different pace depending on a number of factors, most settlements founded by Amish in New York are still in existence today. There have been at least three that have gone extinct, however. These include the original settlement at Croghan in Lewis County (1831), which eventually assimilated with more progressive church movements, as well as a settlement at Sinclairville in Chautauqua County in Western New York, which lasted a decade from 1950-1960. Recently, the Amish settlement at Poland, New York, became extinct after five years in existence (2002-2007). A new community, unrelated to the first, established itself at Poland in 2007. Amish continue to arrive in New York today. The Amish population in New York has been described as the fastest-growing in North America. In the past ten years, Amish have established over a dozen settlements in New York, many attracted by the prospect of inexpensive farmland and communities more isolated from pressures found in other Amish settlements. These newer settlements typically number just one or two church districts, but prospects for growth in many are good. As New York continues to offer Amish settlers suitable land and relatively sheltered locations in which to found communities, Amish settlement in the Empire State is likely to continue. 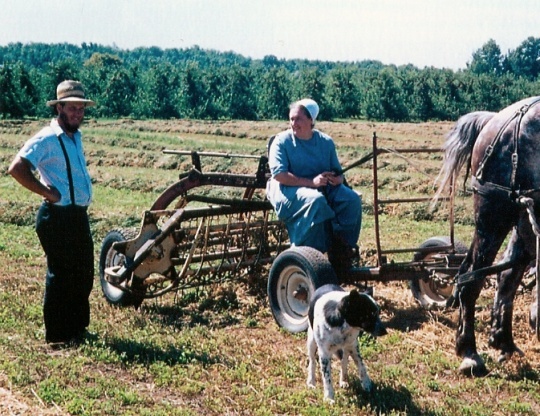 New York Amish have been featured on the Amish America blog on numerous occasions. 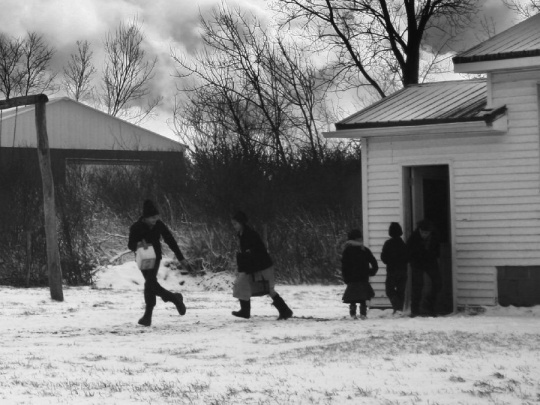 In 2008, a reader shared photos from the Byler Amish settlement in Montgomery County, New York. In early 2009, Professor Johnson-Weiner discussed her upcoming book on the New York Amish, and topics such as factors which have caused Amish to move to New York, areas of conflict, and tourism. In a post entitled “Marketing the Amish”, we featured a photo of the Amish Market in New York City. New York made headlines as one of a number of states with large increases in Amish population in both 2008 and 2009. Warning signs in New York were mentioned in a post examining buggy safety across America. Settlers from New York were among those Amish who helped clean up after Hurricane Wilma hit Florida in 2007. Looking for some Amish horse trainers to consider to break my mare drive team to ride. Hoping to locate a few to consider within an hour or two from Syracuse area. Any farms someone could give me locations of, since no way to make contact other than to drive there. Thanks for any suggestions. I see you were also looking for an Amish trainer who might train horses to drive. I too am looking for someone near Lewis County in the Adirondacks? Thank you and if you know anyone I sure would appreciate any info you could give me? I am looking for an Amish Sawmill near Syracuse NY that is up and running during the winter months. Please let me know the addresses so we can drive there and speak to them. Thank you! There are several in Summer Hill N.Y. Exit 12 off Interstate 81 to State Rt.90 West appr.15 mi. There is one on Route 26 between West Eaton and Georgetown in Madison County. They work all year round. Nice people. We are in the process of preparing to sell our home in Carlisle, NY. We know that there is a growing community of Amish in the area and are wondering if there would be interest in purchasing the home. The home sits on 12 acres of land, has a wood burning stove, a spring fed well, two sheds, a large driveway area. If interested, please have someone contact me. Maybe you should go to talk to them? I don’t think the Amish are going to be cruising articles about the Amish, and just happen to see that you are selling a house. Something tells me you’re not a good guy to deal with. I am actually a great person. I am a God fearing man. I am trying to sell this farm for my old boss his wife passed away in Florida in there summer home. It is to hard on him to come home every summer it reminds him of his wife to much. He asked me to try to reach out to the Amish because he really would like to sell the farm to them. I literally do not know any way to contact Amish community and assumed this site might be a good way, sorry to bother you and feel free to take this post down. Hi Bob, it is fine to post that here, people do post various offers from time to time on this site, directed towards Amish people. It’s true that I don’t know how effective it will be in terms of reaching Amish people – while we do have some Amish readership, the majority of Amish are getting their news media in more traditional forms like newspapers and newsletters. That said, I have heard of Amish people finding things on this site through some unexpected paths 🙂 In any case I hope you can find a buyer soon, Amish or not. Where are you located? We may be able to help or refer you to someone. Was wondering if any of the Amish communities buy Treadle Sewing Machines? I have collected may over the years and most are in beautiful condition. I assume that is what they quilt with and make their clothing. If it is something they would be interested in let me know thank you. I live in otsego county and looking for a amish furniture builder. One they build and sell on site. Can anyone help me. I will travel to the right person. I have an old set of 4 buggy wheels in what look like usable condition–spokes fit tight, no soft wood, no movement, no damage. Iron around hubs, iron rims. They had always been stored indoors. Still have their original faded red paint. I’d like to sell them to someone who will use them, and not let them rot as lawn decorations. Scotia, NY area. Can anyone tell me whether there is any market for these, and where I might sell them, or what price range they would fall into? how much do you want for them. I am restoring an amish buggy. The going rate which I bought four last year was 100 dollars for fairly good useable. Most amish in my community are going to fiberglass/titanium wheels due to the durability factor. I wish to go to the Amish Mall in Prattsburgh, NY. I haven’t been there in years and can’t remember exactly where it is. I am thinking it might be on Mattoon Road. Can any one tell me exactly where it is? Thanks you. Unfortunately the family that was operating the mall in Prattsburgh (located on Bull Hill) has left the area (just this past year) and moved to Pennsylvania. Wow! What a Lively Dialogue! Hello, Eric and friends: I grew up in Essex County NY, but have not lived there since the early 60s. I have enjoyed reading the questions and answers concerning the Amish, their settlements and commercial activity in NYS. Hi Bill, thanks for your comment, I am a little late replying but just swinging back through here 🙂 Funny story, I think we should at least try to spread the word to them so the NY Amish are not uninformed of their task! I am looking for polywood Adirondack chairs in capital district. Any Amish locations in capital district? I am a girl of 15. I live in New York, for years, I have wanted to live with the Amish and I have not found a way to. This is my last resort and it seems you know a lot of Amish. I fear that if I do not have a chance to join them I will die alone. I am not Amish, but I feel like I belong with them. Please, help me. Greetings Jasmine. Spending time working with and living among the Missouri and Illinois Amish communities, I can tell you it is certainly possible to convert. It takes a strong willing desire to come away from many conveniences of the world. Not many are able to deny themselves the modern conveniences. If you are serious and willing to be diligent to guard your heart from becoming attached to the world’s vices you can pursue your future. The schoolhouse teacher at one of the communities near us is the daughter of one who has converted from those of world to the Amish life. If you are interested I could put you in contact with her. suitable option. Here again, the very role of international car shipping company can’t be undermined anyways. they could have used inside the past. Amish community because I’m highly interested in doing a story about it. Could you help me? Thank you very much in advance. I am wondering if there are any Amish sawmills in the Oppenheim area. It is my intent to build a cabin. Contact Shem Swarey @ (315) 429-3627. He has a sawmill on Bacon Brook Road just outside of Dolgeville. I am looking for Amish to replace my roof in Delaware County in Up State New York State, because my roof is for an Old Historic Barn that I know only the Amish will know how to properly repair, and preserve for generations to come. This is my home. I apologize for working with a low budget looking for the best bidder from the Amish who I would love to see do this work. Thank you and God Bless You. My old boss wants to sell a farm house two very large bedrooms, cattle barn, 80 acres of land, brook in the back yard, wood shed, chicken coup, for $120,000.00 In Altona NY. Anyone know of any Amish in the Gowanda or Clymer area that build bedroom furniture?There were Troyers in the Chautauqua area that had a store in the mall but they left a couple of years ago. Are there any Amish establishments in southern California that would house a family for a day and night experience? I was very excited to see that in Pennsylvania there’s a one day and night experience to live with the Amish. Can anyone help? I am an American Painter of some renown. I am very interested in finding an Amish Community where I might be able to live amongst, or at least visit and interact a number of days each week, for a period of a few months, preferably in the summer. I am also willing to work a couple of days a week in whatever capacity needed, to broaden my experience. I wish to do a whole series of paintings about the people, their culture, and my experiences there. I am respectful, and willing to abide by any rules or requirements set forth by the community, and would welcome any suggestions. There are several Mennonite buggy makers in the Penn Yan, NY area. I’m looking for Amish close Buffalo city. Please help me! There is a new Amish settlement at Westport NY. This group originated from Heuvelton NY and began moving in during the late winter of 2017. There seems to be considerable recent Amish interest in settling in the New York side of the Champlain Valley. Hello, I am looking for a horse and carriage in the Madison County area for a film shoot. It is a paid job and only a few hours. Any leads would be appreciated. I am in search of Amish roofers in the Philadelphia, NY area who are ready for immediate hire for a roof replacement, floor, leveling, and some framing for an old Victorian style home. Can anyone point me in the right direction. I was wondering if anyone can tell me of the Amish or Mennonite OWNED businesses in the area of NY between the triangle these Interstates make: I-81 (on the west), I-90 (on the north), and I-88 (on the east). Specifically the countuies of Cortland, Madison, Chenango, & Otsego, towns of Hubbardsville, New Berlin, Brookfield, Morris. Looking for bent & dent, food stores, general stores, feed/tack, harness repair, buggy maker/repair, horse trainers, horse breeders,farriers, furniture shops, & restaurants. Thank you! Inquire of Roy Weaver at Morris NY. Is there any Amish builders that do work in Guilderland,NY near Albany. I’m looking for a 48×36′ pole building. The settlement here slightly overlaps Chenango County and Madison County as well. There are 4 Churches. Mostly agricultural, a lot of sawmills a few stores for canvas goods,a couple harness shops a few nice dry goods stores, furniture shops, and a couple grocery stores as well. Some very good framers and carpenters. Nice to see new barns go up all around. Some are just starting to leave however ( 2 families just yesterday)for a new settlement in or near Lyndon Kansas. I guess the grass is always greener. I have 37.7 acres outside of Fultonville NY and most of my neighbors are Amish. I would like to sell my property but don’t have a way of getting in contact with them. Here is the link. I am a physician who is interested working with a community. I am willing to drive to a center location or home. Please connect with me if you have any questions. Last year I located Henry, that is Amish, in the Rochester Farm Market. He is from Ithaca NY and installs metal roof in and around Rochester NY. I have not been able to locate him again, and would like to have him do another Roof for me. Good guy and does good work with his son. Any idea how I could reconnect since he does not have a phone?